I want to take a moment to cherish what freedoms we have.. the freedom to vote, to practice our choice of religion and faith, to walk freely in what ever clothes I chose, in many fields... to freely smell flowers and appreciate the Glory of God in the simplest of creations. 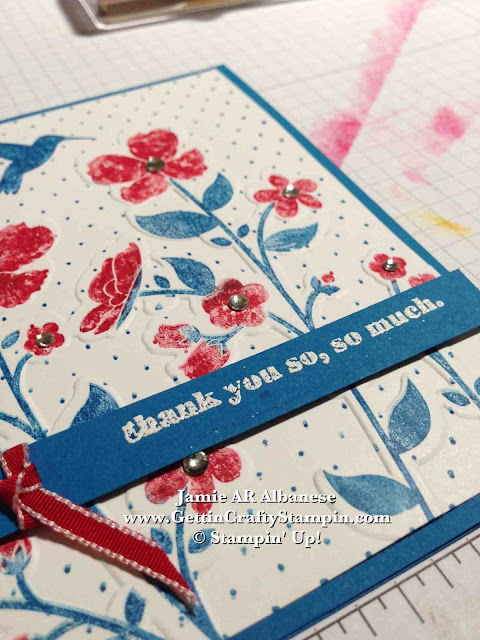 using our new Stampin' products from NEW Catalog that starts June 1st! 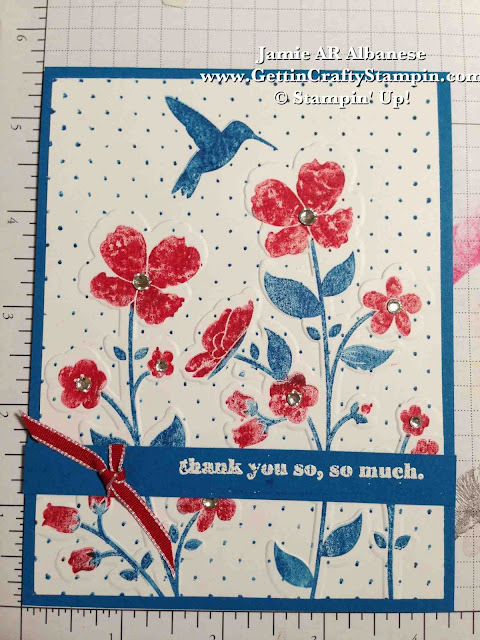 Our NEW Wildflower Meadow background stamp (#129165) reminds me of my Nanna with the beautiful hummingbird (we loved watching our hummingbirds outside our windows...). She often reminded me of the freedoms we had and how they were hard won. 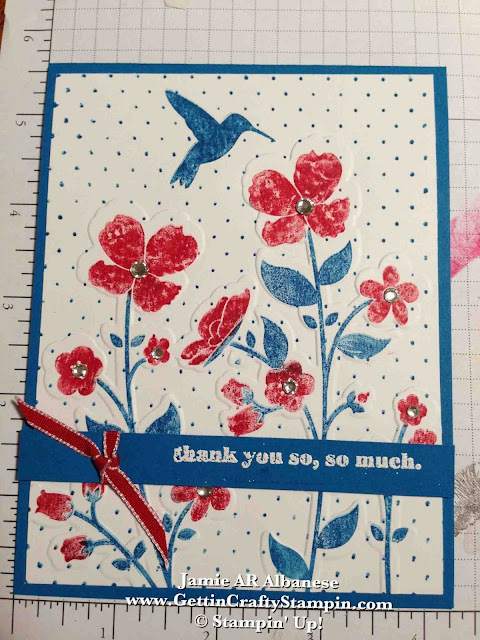 Our Stampin' Write Markers in Real Red (#100052) paint the flowers and Pacific Point paint the stems, polka dots and hummingbird. Huffing on it to re-moisten the stamp that I painted - see the colors are water based ink so the huffing on it with my mouth will re-moisten the colors for a wet inked stamp. Raise those flowers after stamping it with our coordinating Wildflower Meadow Embossing Folder (#129376) and our Big Shot (#113439). When you've inked and stamped the image it is easy to line up the folder and embossing a raised emphasis on the flowers. the beauty we are free to appreciate. A dash of Sparkle with our adhesive backed Rhinestone Basic Jewels (#119246) in various sizes fit the centers of the different sized flowers (with 150 jewels per sheet for only $4.95 this is a MUST for ALL crafters). Tie it ALL Up with this sweet 1/8" Real Red Taffeta Ribbon (#119251). 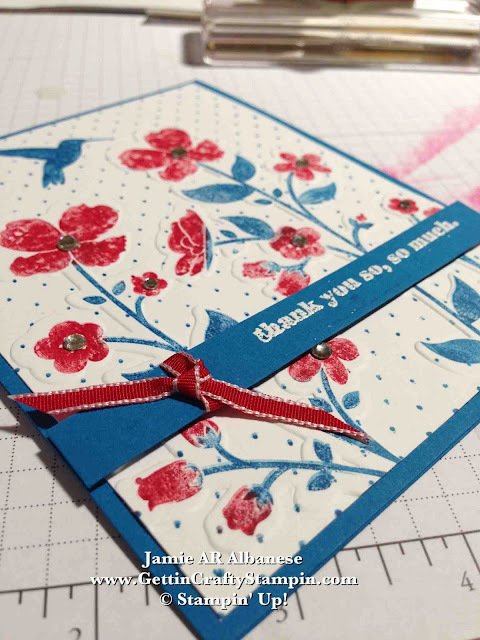 Trimmed in White - this pops and highlights the patriotic feel of this card. Thank you, Veterans, Soldiers, and Military Families, for the right to pick flowers, to walk freely in the fields of life and enjoy the beauty of our land of the free. Go Patriotic... have FUN and Take a Spin in how you show your American Pride! I struggled with this stamp set. Carol and Christine (some of my stampin' friends - luv ya, ladies!!) and I discussed this set. How to make it cool? How to have fun with it?? I really enjoy the results of this card. I hope this Spin on our Nation's colors embrace the beauty of our land and our freedoms. What do YOU think?!?! Please, leave me a comment and let me know!! Please SHARE this on Pinterest, Facebook, Twitter, LinkedIn and email.... and remember that you can follow me on all of those avenues, too! Share me with others... CLICK HERE and consider playing with your friends and family at a Private Class... it's a ton of fun and waiting for YOU! CLICK HERE and consider joining my team of Stampin' Demonstrators! I've been blessed to do this for over 7 years and have loved every moment of it, every stampin' friend I've made and my fun of stamping, crafting and blessing others! !